We have come to Bart Ehrman’s response in the book review session (SBL 24-32) of David Parker’s An Introduction to the NT MSS and Their Texts (CUP). By this time we had relocated to a large hall where all interested could join the session. The picture actually shows the smaller room which we left after Epp's presentation. Bart Ehrman started with a few positive words about the book. It contains some astounding material and depth. No one can master the whole field, but some come very close, like David Parker. Ehrman emphasized this since, the critique he was going level might suggest otherwise (“and it will” he added), and therefore he wanted to express his view at the beginning that Parker is the leading text-critic in the world. The book is the best introduction to MS as artifacts. It is unparallelled in its discussion of many contemporary issues (like using computers, and making editions). However, Ehrman has serious reservations about the book, especially as an introduction to textual criticism. He thinks it is idiosyncratic and incomplete, and that it presents a biased picture. The first problem Ehrman brought up was Parker’s idiosyncratic use of terms like “document,” “New Testament,” and “textual variant.” Why does he choose to problematize these terms? Why not problematize the term “text” which he uses in a number of ways himself. This would matter much. Another problem are the omissions. According to Ehrman, Parker often has a set of blinders, which would be proper in a monograph when you deal with a thesis, but the genre of introduction does not allow for such omission of what would be very important. Then Ehrman brought up examples of serious omissions. Why, e.g., mention just the Gospel of Barnabas (not other gospels or Apostolic Fathers.)? Ehrman suggests that the book is an idiosyncratic discussion of issues instead of an introduction. Parker has expressed in the book that he sees no point in repeating things that has been said better by others, at those points he refers to others. But we are led then to conclude that those issues which are discussed are discussed better here. But then it is not an introduction, it has to be used along with other books. How many books does one need? Parker’s grounds for including points seem arbitrary: he does not include issues he has not been asked about, teached about, or felt inclined to look into. There is no discussion of palaeography! Nothing about book production. No discussion of early NT MSS (he does not tell which they are). No history of the discipline. No discussion about the goals of textual criticim, nothing about manuscript classification (for example, the Claremont Profile Method is mentioned without explanation). There is nothing about the quantitative method or the Comprehensive Profile Method. Nothing about external vs. internal probabilities. How is it possible to write an introduction for students without telling this? The introduction to versional and patristic evidence is very sparse. For example, the series NT in the Greek Fathers is mentioned in one sentence (and nothing about why it is important). There is nothing about scribal habits, nothing about the use of textual criticim for the social history of the NT, or how the Christological controversies have affected textual transmission, which is probably the hottest issue since 15 years (because of Ehrman’s own contribution, implied). Then there are terms included like “corona,” “hairy sides,” “palimpsest,” “catena,” etc. which are not defined. A glossa is provided, but it includes only 45 terms and is idiosyncratic. For example, it indicates what papyrus is but not parchment. Here Ehrman began to take his critique too far ridiculing some of the less well formulated statements in the book, which is unnecessary to cite here. The ironic tone became rather embarrasing for the audience, not to mention the author. Ehrman concluded that these examples of problems could easily be multiplied. This shows that the book is idiosyncratic and not useful for students. Then Ehrman said that he “wanted to mention some substantive critques.” Ehrman brought up the contempt Parker shows against the quantitative method. Parker seems not to understand what he is attacking (and e.g., why singular readings are removed in this procedure). Parker apparently paves the way for Mink’s method (CBGM), see p. 169. It is not Lachmannian. However, the CBGM is based on the use of external and internal critiera, which Parker does not discuss (except the note on p. 169). The CBGM presupposes that we know what is the initial text in each passage (based upon common text-critical reasoning). Here I think Ehrman went way too far in his critique, probably because he had not understood the CBGM entirely (very few have I should add). For example, the CBGM involves several steps and an iterative process that controls the individual decisions, and, in fact, the first step involves a kind of quantitative analysis (which Ulrich Schmid pointed out in the discussion). Significantly, Parker says an author’s text cannot be established, and no editor tries to do it, but in this regard Ehrman shows more optimism, especially appealing to internal criteria. In some respects Ehrman actually seems to “fight himself,” since he sometimes expresses an agnostic view of the initial text, since what we have are "copies of the copies of the copies," etc. (the mantra being “we just don’t know"). In this session I got the impression that he has become somewhat more optimistic about the initial text. Just before the meeting, during November, we were involved in a long debate on the Textual Criticism discussion-list on this and related topics (here and a number of subsequent messages in some separate threads). Ehrman’s conclusion: Parker’s monograph is a very valuable book, but as an introduction for beginners to the field, it is wanting. I agree with this general conclusion, but I think the way in which this review was presented was unfortunately also wanting. Cf. Jim Leonard’s summary of Ehrman’s response here. I heard afterwards that some in the audience were “put off” by the heated attack and felt they had better avoid the field of textual criticism, which I of course think is sad. I pointed out to some that this attack should probably be seen in light of a previous very critical review of Ehrman's revised version of Metzger's introduction to Textual Criticism by Parker in an issue of JTS, but of course the polemic went too far. In any case, Parker got a final word of response, which was good for the session. As the gentleman he is, he managed to make a constructive appeal that we should not linger on in the obsolete, but move forward and accept the new discoveries and developments in the field. These are exciting times for textual criticism. In the time for questions I responded to Hurtado’s previous response. I perceived that Hurtado was expressing that there has not been so much recent development in terms of external evidence—we still depend on much of the same data. I pointed out that the CBGM actually provides a better way of evaluating the external evidence. Ever since the days of Westcott and Hort we depend on a procedure where we go from internal evidence to external (manuscripts are found to be good because they contain good variants in individual passages, although other purely external features like age play a certain role). I view the CBGM like a “calibration” of this procedure, moving from internal to external evidence in a much more controlled way. We are able to see how our decisions cohere with the larger picture of the global stemma of textual flows. My next response was to Parker. He has expressed the view that the CBGM can help us get a snapshot of the earliest attainable stage of textual transmission. In the Pauline corpus this is a reconstruction of a collection. We know there was a prehistory but we cannot reach it. I disagree with Parker. 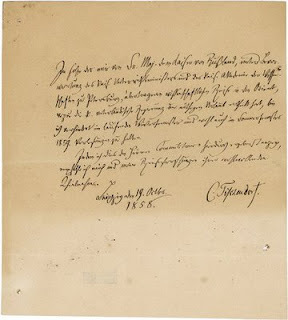 The same issue was debated in the Münster colloquium earlier this year (see here). I think our evidence may take us beyond this stage for two reasons. First, we make use of internal evidence, and I think this criterium means we are moving beyond the collection (see further my correspondence with Ehrman on the discussion list). Second, I have a strong suspicion that the CBGM results on the Pauline corpus, which we have not seen yet, will be analogous to the situation in the Catholic Epistles where the separate books seem to reflect a somewhat distinct history of transmission, i.e., the “snapshot” seems to take us back to a stage when the books circulated separately. Slightly different MSS show up at the top of the stemma for each book (although Vaticanus is the only MS always among the top MSS). Interestingly, letters like 1 and 2 Peter have more in common, suggesting that they traveled together earlier on in the transmission. I anticipate similar results for the Pauline corpus. I agree with Parker that times are exciting for New Testament textual criticism! This is also a good summary of the blogging year of 2008. I take the opportunity to wish all our readers world wide a HAPPY NEW YEAR! 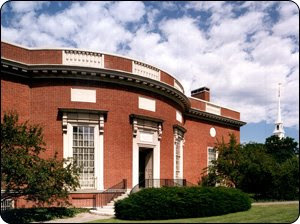 In spite of Peter Head’s posting as of yesterday, “SBL Finale” (about the visit to Houghton Library, Harvard), I am still stuck at the conference in Boston. I hope I will be able to finish my SBL report before the new year. We have arrived at the Monday morning NTTC session (SBL 24-32), which is the book review of David Parker’s An Introduction to the NT MSS and Their Texts (CUP). Apparently, this session was very popular. Someone said they did not want to “miss the fireworks." There were so many people who wanted to attend the session, so when it began there was possibly a larger crowd left outside the packed room than inside! ” I sat so close in that little room (with my computer on my lap), that I could almost reach out and zip a panelist’s glass of water. Peter Head came a bit too late, and couldn’t get in, so instead he went out to find us a good restaurant for the ETC blog dinner that night. And he really did find a perfect place, an Italian restaurant nearby. After the first speaker, Eldon Epp, however, the session was relocated into a huge hall, and suddenly there was plenty of space so everyone could get in. Again, the following summaries are filtered through me, building on my notes; I may have gotten some things wrong. Epp had been asked to give a description of the book (therefore he had asked for extra time). In his judgment the book is not for the beginner, but a treasure trove for the advanced user. Some parts make up small monographs on their own. All will want it on their desk. It is a scholarly and praxis oriented volume. Epp then mentioned Parker’s earlier monographs, especially The Living Text of the Gospels dealing with the controversial issue of the original text (which made some corners of the TC world tremble). This study had inspired his own article on the “multivalence” of the term “original text.” In Epp’s judgment, this third monograph reflects the same scholarly precision. After a very general description, Epp then devoted the rest of his discussion specifically to Parker’s call that the concept of “text-types” be abandoned. [This is also the standpoint of several scholars at the INTF in Münster]. This seems natural since Epp has been one of the strongest and ablest proponents of the concept. Here he offered a defence of the general concept of text-types, but, at the same time, he was open to modify the specific terminology. There are admittedly some inaccurate labels, e.g., “Western.” However, what we name a particular text-type is not the issue (Epp has earlier proposed A, B, C and D-text type). Moreover, the term “type” connotates strong integrity; Epp thinks “constellation” or “cluster” is better (cf. astronomy, prominent stars create a pattern, overlaps in the margins with other constellations). Parker has stated that the text-type concept has stagnated. But there are undeniably two early streams and one later (Byzantine). Epp thinks the strong evidence speaks against the stagnation of the theory. Moreover, multiple approaches are better than fewer and many scholars have referred to the text-types (continuity in the scholarly discourse). Parker says that there are so great differences between the witnesses (e.g., P45, P66, B, D, etc), which calls for an individual focus. However, the issue is not size and quantity, but quality. Epp suggests that various circumstances caused suppression of some texts. Hence many D-text witnesses were altered and conformed to the B-text and the Byzantine text. There are therefore fewer D-text witnesses. Parker says the theory does not apply to Acts, where we have two texts in Acts. Epp wonders why this undermines the theory? They are simply the textual clusters in Acts. Epp refers to Parker’s example of 614 where there is so low agreement with D (614 is claimed to be “Western” by some). The problem is the 104 testpassages in Acts. They are not useful for the purpose. Codex D is extant in only 72. One of the papyrus (“proto-Bezan” P38) was not included because it was extant in too few of the selected test passages. It is instead necessary to compare P38 with D in all places of variation. There is a high level of agreement. Clark said the text was almost identical, ignoring those variations that do not change meaning. Those that agree in sense are 24/29. This adjustment is a significant methodological issue. Then Epp moved on to compare 614 with D with a different method than that used in Text und Textwert (where all variants are counted), which resulted in a higher agreement with D (64%). Parker only compared Greek MSS with Greek MSS. Epp’s, on the other hand, proposed that the D-text is a valid constellation if we include versional and patristic witnesses. All these witnesses are mixed with a D-text nucleus. Barbara Aland says that 614 has not the typical D-interpolations. Epp explains that the longer additions, etc. were the most obvious candidates for omission in the later centuries (when the Byzantine text dominated), but the minor traits were retained. A raw comparison in Teststellen will not be useful to identify the D text-type; it will only reveal agreements/disagreements between mixed texts. The method neither suits mixed material nor the historical development that created it. Neither does the CBGM method (only treating Greek MSS). We cannot assume that Bezae best represents the D-text in Acts. Epp proposed a more appropriate method to identify the D-text, which he called a “triangulation of witnesses” procedure. The search for the D-text must begin with the common variants (which involves the search in non-Greek witnesses) and the identification of core witnesses. Because of the expansive and paraphrastic nature of the D-text, each variant must be scrutinized for the meaning (the Text und Textwert method only serves to exaggerate the differences). Epp thinks the D-text has several fixed points. He often referred to Tuckett’s treatment of this problem, using this type of method. On Tuesday afternoon after the SBL conference had finished a group of us, mostly from Tyndale House in Cambridge England, but with some extras who happened along, took a trip to the other Cambridge (where Harvard is) to the Houghton Library (opposite) to see some mansucripts. It was a pretty dismal wet old day so it was nice to get out of the rain and get our hands on some ancient manuscripts. Here are some links to images of the manuscripts we saw, analysed, deciphered, argued about and generally had a great time with. It was very good to see this, to read the text, to check the cursive and to appreciate the blank bottom of the page and the blank verso. Clearly a school text, as Cribiore has argued. This is quite wild and careless, with strange variants and poor orthography. I wouldn't trust its text very far. Nice to see before Christmas. Surprisingly beautiful in the flesh. I am very grateful to Susan Halpert, Reference Librarian at the Houghton for organising our visit. In SBL 22-69 Don Barker discussed (in a change to the announced programme) P. Macq. Inv. 360 (which with P. Mil. Vogl. inv. 1224 makes up NT P91). This early third century papyrus contains the remains of part of a single sheet of a manuscript of Acts (2.30-37, 2.46 - 3.2), written in a semi-informal hurried block script with some influence from cursive. Some inner margins survive, calculations suggest that the written area would have been around 24 cm x 14.4 cm (plus margins). Previously unrecognised, but pretty clear in the images shown were a series of vertical fold marks, which suggested that this portion was from the middle left-hand edge of a folded page, which had been reused, folded and kept as a healign amulet. Don proceeded to demonstrate how this worked with a scale replica of the papyrus which as a finale he folded and then tore into pieces. Michael Theophilos presented 'A New Fragment of James from Oxyrhynchus'. This was an excellent presentation by one of the maestros of image-presenters (for his recent "fame" see this report of his impact on NOBTS) and dealt with a new P. Oxy. NT text forthcoming in volume 75 (hopefully). It is identified as 51.4B 19/c(1-4)b. This means from Box 51; from the fourth excavation season (hence 1902); the 18th folder; layer c; from a group of four fragments; of whcih this is the second (b). It has 10 lines of text, measures 10x13 cm; and is the top right hand corner of a leaf containing James 3.14-15 and 3.18-4.1 in a large round uncial. A lot of attention in the presentation was given to the result of some MSI on a ambiguous letter on verso line 8 (the MSI resolved a perceived problem). Ingrid Lilly presented a discussion of the marginal notes in LXX P967 Ezekiel, which has seven different types of marginal marks and notations all of which seem linked to reading. An interesting talk with a good handout (probably could have done with some images to help); and an important area of study. Dave Nielsen discussed the early manuscript witnesses to the Shepherd of Hermas from the perspective of 'the Question of Developing Canonicity'. Given the popularity of Hermas (28 extant greek mss; lots of translations; 12 mss from II-III) this was interesting (for some details see Hermas notes). He basically noted that in terms of codicology, palaeography, punctuation etc. the manuscripts of Hermas are indistinguishable from mansucripts of texts which were included into the New Testament. If the NT mss were of texts regarded as Scripture; then probably Hermas was similarly regarded. Recently we posted an old note from Westcott on 2 Pet 3:10, and our readers transcribed the document. Here is another little item you can try. I noticed this letter l when it was for sale on e-bay perhaps two years ago (now I cannot remember). This weekend Codex Gigas (The Devil's Bible) received a lot of interest in the US. As we reported last week, there was a documentary on the the National Geographic Channel yesterday (and the week before in the UK). Apparently, many viewers searched the web for more information after the program, and it seems as if several websites have linked to this blog (e.g., here). Only today we have had over 1200 visits, which I think is all time high. For those of us who could not see the program, there are some clips of varying quality on YouTube featuring the spectacular manuscript. There is another clip here showing what appears to be the production of a facsimile. Does anyone understand Czech and can tell us what they are discussing? Here is a film clip from a TV program in Spanish (TV), on the codex and its temporary transfer to Prague. And, finally, here a clip showing how a replica for the documentary "The Codex Gigas" was made. I have read that the producers of the documentary were only aloud to turn the pages of the actual MS once. For more scholarly material on the codex one should visit the Codex Gigas website at the Royal Library here. 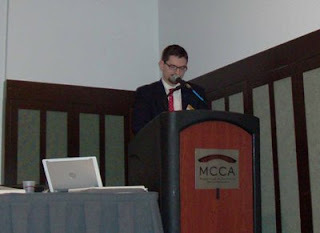 In my blog series from the SBL in Boston, I have decided to leave out the papyrology sections I attended. I hope Peter Head can make a summary of those sessions. However, I will make an exception for two papers related to a subject that interests me, namely amulets with biblical texts. The following papers were presented on Sunday afternoon, November 23 in Papyrology and Early Christian Backgrounds. Again I must emphasize that the summaries below build mainly upon my fragmentary notes from the session. De Bruyn started with a general description of common criteria for identifying amulets, which he defined as: 'an item believed to convey spiritual power for beneficial or antagonistic effect'. b. Biblical text that are normally cited on amulets (esp. protective texts such as Ps 90; the Lord's Prayer), in abbreviated form (incipits of gospels, first verse of a psalm); Biblical texts cited in a confused manner; staurogram at the beginning or end, doxology at the end (embellishments), use of alpha and omega. b. item was or could have been worn or fixed (small size), folds or rolls discernable, presence of holes or string. An identification involves a weighing of probabilities whether an item was used as an amulet, i.e., whether that is the most likely purpose, or just one of several possible purposes. Often the verdict depends on a combination of criteria. The handout included many items classifed in categories 1-2 (there were no examples of the other categories on the handout). Items in category 3 poses a challenge. In such cases it is not possible to rule out another use of the text (de Bruyn cited an example with Ps 1). One cannot be sure wheter the item was worn (whether it was folded, etc.) and other features are open to several interpretations, etc. In the time for questions I proposed another criterium, namely a text-critical, related to the degree of textual variation. Does the item reflect a high number of unique readings, as resulting from sloppy copying or even conscious alteration related to the specific purpose? At first de Bruyn did not understand what I meant, but after the session was over I explained my point, which he seemed to accept. Because of the interrelatedness of their topics, de Bruyn and Granger Cook had agreed to change the order of their papers in order to have a more logic sequence. P50 contains two selections from Acts (8:26-32; 10:26-31). The first editor, Clar Kraeling, believed that the text might have been for "missionary" or "homiletic" purposes or both, whereas subsequent scholars (e.g., Joseph van Haelst and Kurt Aland) have concluded that it was a amulet (de Bruyn has classified it as not likely, but I think he had had correspondence with Granger Cook). However, there are several indications that P50 may have had a different function. Granger Cook agreed that the criteria used for evaluating texts as Christian amulets needs a reevaluation. This item contains excerpts, but does not correspond to lectionary division. There are no liturgical or devotional implications of the text. The text is about the conversion of Gentiles. Granger Cook went through Christian writers to show that these contexts played an important role (both for Greek and Latin writers way into the middle ages). Both texts were used in homilies emphasizing evangelism. Hence, Granger Cook did not think the item should be classified as an amulet (contra e.g., Krueger and others). Maybe it had missionary, homiletic or didactic purposes (in the context of Christian mission), in line with Kraeling's original description. Vaticanus Umlauts in a Patristic Text? James Snapp announces an interesting find on the Textual Criticism discussion list (read the message here). As he was looking for further evidence of early writers' utilization of Mark 16:9-20 he came across an article, H. L. Ramsey, "Our Oldest MSS of St. Cyprian, III: The Contents and Order of the Manuscripts L N P," JTS 3 (1902): 585-94. Ramsey describes some features of Codex Vindob. 962 (MS L of Cyprian) from the ninth century, that resembles the Umlauts in Codex Vaticanus. Wieland Willker has made available the relevant page from the original article by Ramsey here. Snapp ends his message by asking, "Were Codex Vaticanus and this copy of works of Cyprian ever together?" We have now arrived at Sunday 23 and the morning session IGNTP23-25, a presentation of the International Greek New Testament Project on the theme: New Research on the Text of John's Gospel (D. C. Parker, ITSEE, University of Birmingham, presiding). The schedule collision meant that I was prevented to hear the initial papers by Hugh Houghton, "New Discoveries for the Old Latin Text of John," and Phlip Burton, "What is an Old Latin Manuscript?" Why did they plan a TC board meeting at the same time as the IGNTP presentation? (some of the boardmembers were actually presenting in that session). When Peter Head and I rushed in, Klaus Wachtel was just answering questions after a presentation not announced in the program book. I do not dare to say anything about that since we just arrived during the last minute. After that it was time for Ulrich Schmid's presentation of the Virtual Manuscript Room (VMR), which was neither announced in the program, but, nevertheless, very exciting, although I had already received a personal demonstration when I was in Münster for the summer colloquium. The VMR contains an indexing mask which works online already. You get a login with login name and can use the password "gast". The mask page presents a preconceived database and an URL page of the image of the manuscript, for collaborators to work with according to the VMR standard. The indexing work is to identify the first word and the last word of the manuscript page of the MS you are working with. Then you can save it, and upload next image. Besides indexing the manuscript images, one can enter bibliographic information, etc. The images are images available on the web already. Especially scholars who are working on transcriptions already, should do this work in the VMR! (I am sorry that I collated hundreds of MSS in Jude on spot in Münster before the VMR was available). Initially the tool was conceived for indexing, but now the INTF tends to think of integration and so the actual transcription will be a tandem process. This means e.g., that the whole team in Münster who works on transcribing MSS will also work in the VMR environment. This is a unversal tool for people. There is a module also at the ITSEE in Birmingham with a different set of manuscripts (not necessarily NT MSS). When the work is finished the VMR will be able to list all MSS that contain a certain passage. Part of this project is to contact holding institutions (this overlaps with the work of CSNTM). For internal use, the INTF/ITSEE use digitized versions of microfilm but only for internal unless they have special permission. Read a more detailed presentation with nice images of the VMR by Jan Krans of the Amsterdam NT weblog here. Krans is currently working in the VMR with Codex Borelianus. Sadly, Jan did not turn up at the SBL in Boston. He was missed by several friends. In case you haven't noticed there are several new articles in the current TC journal (vol. 13), including a nice piece by our own Peter Head (originally a paper from SBL in San Diego). Gerald Donker, "Athanasius's Contribution to the Alexandrian Textual Tradition of the Pauline Epistles: An Initial Exploration"
Peter Hill, "Matthew 16:18 in the Philoxenian Version"
Peter Head, "The Gospel of Mark in Codex Sinaiticus: Textual and Reception-Historical Considerations"
Maria Teresa Ortega-Monasterio, "Textual Criticism of the Bible in the Spanish Renaissance"
Curt Niccum, "Ms 2345: A 15th Century Ethiopian Manuscript of Acts and the Catholic Epistles"
Also check out the many bookreviews, including Peter William's review of Sebastian Brock, The Bible in the Syriac Tradition, 2d ed. and my own extensive review of L.W. Hurtado, ed., The Freer Biblical Manuscripts: Fresh Studies of an American Treasure Trove. For those who have followed my report from the SBL I have completed Saturday 22, almost . . . In the evening I attended the SBL reception, where I met several folks. I ran into Jimmy Adair, the editor of TC for the first time in person. He had apparently enjoyed our presentation earlier that day. We had a nice chat and he invited me to join the editorial board of TC, and the board meeting next morning, where there were also SBL representatives (TC is now an official SBL publication). I accepted the offer. The downside was that I missed two very interesting papers in the IGNTP session on Sunday morning, but more on that session soon. * The Devil’s Bible is so huge that it requires at least two people to carry it. * Once considered the eighth wonder of the world, the Codex Gigas stretches three feet long and weighs a hundred and sixty-five pounds. * It is the only book that places the Old and New Testaments alongside violent, holy incantations. * The Codex Gigas contains one full page – right opposite the devil portrait – of a towering Heavenly City. Although no people can be seen in the Heavenly City, it is a symbol of hope and salvation, a contrast to the portrait of the devil on the opposing page. * The Codex Gigas includes mystical medical formulas for anything from treating ailments such as fevers and epilepsy to resolving practical problems such as finding a thief. * The book's transfer to Prague in 2008 took a year of planning. It was insured for $15.1 million during the transfer. * The Devil’s Bible has 600 pages, which is 310 parchment leaves, all made from donkey skins. To this we can add that the codex is deposited in the Royal Library in Stockholm. I wonder why they did not include this information. I think it is our second most valuable book in Sweden (next to Codex Argenteum). Recently, Codex Gigas was on loan to Prague (whence we Swedes once stole it...). Read more about this codex in our previous report here. Update: The fact about donkey skins is probably wrong. We commented on this in the previous report in 2007, that a new analysis has shown that it is made of calf skins. Wallace announces the release of two DVD:s on the Parchment and Pen-blog here (includes order info.). I think I heard from someone that he mentions this blog in the first one (the plenary lecture at the ETS meeting). Maybe someone can confirm that? Philip Payne tells me that CUP has authorized him to make available for free download his recent article "1 Tim 2.12 and the Use of ουδε to Combine Two Elements to Express a Single Idea" New Testament Studies 54(2008): 235-253 on his homepage here (where you will find other articles too). Update:: Philip tells me tht a more detailed form of the paper read at SBL (which I recently blogged about) is accepted for publication with the other papers read at a Colloquium on Codex Vaticanus B in Geneva, Switzerland, along with the three essays currently only available in the Prolegomena volume of the Codex Vaticanus B facsimile. His new article is forthcoming as Philip B. Payne and Paul Canart, "'Umlauts' Matching the Original Ink of Codex Vaticanus: Do they Mark the Location of Textual Variants?" pages 191-213 in Patrick Andrist, ed., Le manuscrit B de la Bible (Vaticanus gr. 1209): Introduction au facsimilé, Actes du Colloque de Genève (11 juin 2001), contributions supplémentaires. Prahins, Switzerland: Éditions du Zèbre, 2009. Personally I remember that it was rather difficult to get hold of books from this publisher (e.g., they would not accept credit card payment), but I hope it will be easier in the future. Moreover, Payne's other area which he has been researching for the past 35 years is forthcoming as Philip B. Payne, Man & Woman: One in Christ (Grand Rapids, Mich.: Zondervan, 2009) prior to the SBL. 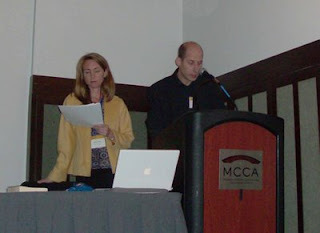 Prologue: I met Jennifer for the first time at the SBL in San Diego. I had read her fine article in JECS on the pericope of the adulteress, in which she also referred to my article in the TC journal on the same pericope. I therefore suggested that we work on a joint paper for the next SBL on the topic of what Jesus wrote on the ground (John 8:6, 8). We both were familiar with the illustration in Codex Egberti where Jesus writes the sentence terra terram accusat. Bruce Metzger had expressed in two different publications that he did not know where this enigmatic phrase came from. At the same time, I had found a reference in Petrus Comestor who ascribed it to Ambrose. Jennifer agreed to my suggestion, and invited me to stay with her family in Brookline (practically a part of Boston) during the next meeting. Initially we had a very optimistic plan to start writing in the Spring, but that plan was soon revised since we both had our hands full. So we just submitted an abstract in February and started working on the paper after summer. We had a very intensive e-mail correspondence during the following months. It has been a delight to work with Jennifer, and we had a marvellous co-operation. In the last minute, just a few days before the presentation, she caught a cold and lost her voice, so I was so glad that her voice was just strong enough so she was able to join in the actual presentation. The paper was based on a much longer version (three times as long) that will soon be submitted for publication. Here I will just offer some glimpses from the presentation. The purpose of the paper was to trace the reception of Jesus' writing from the origin of the story until medieval times, and specifically offer a plausible suggestion of the origin of the phrase terra terram accusat and how it came to be used. Offering an opinion on the propriety of capital punishment, the fourth-century bishop Ambrose of Milan turned to the story of the woman taken in adultery. Christians do well to advocate on behalf of the condemned, he argued, since, by doing so, they imitate the mercy of Christ. Nevertheless, the imposition of capital punishment remains an option for Christian rulers and judges. After all, God also judges and condemns, as Christ showed when he wrote twice on the ground, demonstrating that “the Jews were condemned by both testaments” (Ep. 68.14). Bending over to write, Ambrose explains, Christ “wrote with the finger with which he had written the law” (Ep. 68.14) and likely inscribed a saying of the prophet Jeremiah: “earth, earth, write that these men have been disowned” (Jer 22:29; Ep. 50.4). Alluding to another saying of Jeremiah a few sentences later, Ambrose continues, “Those who have been disowned by their Father are written on the ground”; by contrast, the names of Christians are written in heaven (Ep. 50.5, 7; compare Jeremiah 17:13). Something like Ambrose’s perspective was recalled some five hundred years later in an abbreviated form, this time in the context of the illustrated pericope book Codex Egberti. Depicting Jesus, the woman, and the men involved in the controversy, the illuminator of this tenth-century manuscript traced out Jesus’ words, in Latin, supplying the phrase, “earth accuses earth” (terra terram accusat). With his speculation regarding Jesus’ writing, Ambrose began what has become a long tradition of supplying what Johannine versions of the story usually leave out: the content of Jesus’ writing. From the time of Ambrose until today, readers have remained unsatisfied with this narrative gap and sometimes they have offered suggestions to fill it. This paper takes a different tack, however, asking not what Jesus wrote or why he was represented writing but what can be learned about the transmission and reception of the pericope adulterae on the basis of speculation regarding this writing. Texts do not stand apart from those who produce, read and interpret them; rather they are written, preserved and authorized within particular historical settings by human actors, who bring diverse assumptions to the texts they interpret and transmit. Viewed from this perspective, textual witnesses that include or exclude the pericope adulterae--and interpretive elaborations regarding Jesus’ writing--bear witness not to an enduring text that stands outside of human history but to a complex interplay of text and meaning across time. Gospel books carry with themselves and as themselves the histories of their multiple engagements, preserving not only particular texts but also the interpretive assumptions that shape those texts. The knotty transmission history of the pericope adulterae highlights this phenomenon further, with copyists and scholars from the fourth century onward taking care to signal the story’s instability, sometimes including it and sometimes leaving it out, according to the dominant text-critical assumptions of their day. Attempts to identify what Jesus wrote or to clarify the significance of his writing supplement this wider phenomenon, with various explanations regarding Jesus’ writing entering textual and interpretive traditions as diverse as the Latin picture book Codex Egberti and the ninth-century Constantinopolitan Codex Nanianus of the Gospels (U 030), the first Byzantine manuscript to supply the detail “he wrote the sins of each of them” (ενος εκαστου αυτων τας αμαρτιας). In this way, interpretive glosses regarding Jesus’ writing were quite literally written into textual witnesses. Similar glosses were also written into commentaries, sermons, images and apparatuses designed to accompany the Gospel, serving as “paratexts,” both within and outside of the material boundaries of the text itself. Proposals regarding what, why and how Jesus wrote, whether ancient or contemporary, therefore reveal as much about the assumptions brought to bear on the Gospel as they do about the possible content and significance of Jesus’ writing. [Then we went through a number of examples century by century of sermons, mosaics, manuscripts, pyxides, illuminations, and other artefacts, that depict the story and offer various insights on the topic of Jesus' writing, specifically tracing the phrase terra terram accusat to Augustine's 13th sermon on Psalm 2, in which the bishop reminded North African rulers that, when judging, they are merely “earth itself judging the earth . . . a human judging a human, a mortal judging a mortal, a sinner judging a sinner” (Sermo 13.4). He then invoked the pericope adulterae, observing that, when the Lord Jesus wrote with his finger, he judged the earth, even as he displayed pity for the woman (13.5). Jacobus de Voragine, a thirteenth-century Dominican monk, scholar and author, serves as our final example. Preaching a sermon on the pericope on the third Saturday of Lent, he offered a list of by then traditional suggestions regarding what Jesus wrote: According to Ambrose, Jacobus reports, Jesus wrote, terra terram accusat; according to Augustine, he wrote this (i.e., terra terram accusat) and then, afterwards said to the woman qui sine peccato est uestrum; according to the Glossa, Jesus wrote their sins (eorum pecccata); and, according to John Chrysostom (who, as far as we know, never discussed the pericope adulterae), he wrote terra absorbe hos uiros abdicatos (Earth, swallow these men who have been disowned) (Sabbato Sermo 1.45-48). Traveling back and forth across languages and time, the pericope adulterae--and Jesus’ writing—continued to be written and re-written, carrying as itself and with itself the long history of its re-tellings, a process that is not likely to end anytime soon. This was another interesting session which also dealt with a manuscript: the 18th Cent manuscript of a letter by Clement of Alexandria to Theodore in which he refers to and quotes from a secret gospel of Mark (discovered by Morton Smith in 1958). But is it really an ancient document or is it a fake or fraud or hoax? 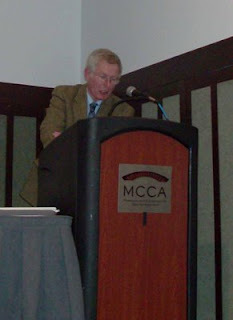 The session featured contributions from Birger Pearson (who has changed his mind and now regards the letter as a twentieth-century fake); Stephen Carlson (who has written a book arguing that it is a hoax perpetrated by Morton Smith); Allan Pantuck (who was a student of Morton Smith and has done some interesting work in the Morton Smith archives); and Scott Brown (who has written a book on the Secret Gospel of Mark material; and has numerous articles disputing with Stephen Carlson). c) that I once wrote to Q. Quesnell about his objections to Morton Smith's study of the letter; and received the reply (in 1987) that Quesnell himself had actually seen the document (in 1983), but had not been allowed to undertake any tests. Mark Goodacre had some early reflections on this session (which he chaired), here; and responds to the tone of Chartrand-Burke's post (especially w.r.t. Stephen Carlson) here. That is fair enough, although from my reading Brown has punctured quite a few of Stephen's ideas (so we wait for his promised? response/s in due course). Up-date: I noticed some more discussion of this session by Josh McManaway at NT Student (defending Carlson [wrongly] as using the method of a biblical scholar [I say wrongly, not because I think there is some secretly accurate scholarly method that biblical scholars learn only by doing a proper doctorate, nor because I think all lawyers are inherently dim, nor because I don't respect Stephen Carlson and know him to be very sharp; but simply because Stephen says in his book he will be applying the methods he uses as a lawyer: hence 'a fresh look from a different approach', p. xvii]) and Michael Barber at Singing in the Reign (picking up Neusner's entertaining repentance/critique of Smith's review of Gerhardsson's book - although any tendency to see Neusner as a neutral observer of Smith ought to be resisted) . Christian Blumenthal, "Es wird aber kommen der Tag des Herrn": Eine textkritische Studie zu 2Petr 3,10 or "The day of the Lord will come": a textcritical study of 2 Peter 3:10. (Bonner Biblische Beiträge 154; Hamburg, 2007). This was a Diplomarbeit at the Catholic theological faculty of the Friedrich-Wilhelms University in Bonn in 2003-4. It studies in detail the various witnesses for the readings, including discussion of versions and citations not usually covered and develops an analysis of the history of the text. The earliest text is found to be ευρεθησεται, which is also authorial. Blumenthal articulates how 'will be found' contrasts with what will not be found and fits into a broader apocalyptic conception. We have reported earlier on the blog, here, that P39 and 0313 were on sale in a Sotheby auction December 3 (Western & Oriental Manuscripts Sale: L08241). As Peter subsequently suggested in the comment section, neither of the MSS were sold. "An unusually large fragment from possibly the oldest copy of part of the Gospel of John failed to sell at a Sotheby's auction on Wednesday. But a compendium containing a previously unknown, 14th century manuscript of Medieval traveler Marco Polo's adventures along the Silk Road and into China the century before did fetch 937,250 pounds ($1.4 million), around four times its estimate. The Gospel fragment, a torn piece of papyrus with Greek writing on it and dated to around 200 AD, had been expected to raise between 200,000 and 300,000 pounds. Its failure to sell was the second setback for the auction, after the most valuable lot, an early Carolingian Gospel Book valued at 2.0-3.0 million pounds, was withdrawn 'at the request of the consignor.'" One of the interesting things with P39 is that its text agrees verbatim with Vaticanus, and nearly so with P75, and the beautiful calligraphy shows that it was produced by a professional scribe. See Reuters' full-size image here. "A fragment from an extremely early codex of Mark. This is Gregory-Aland 0313, one of a small group of early Christian manuscript fragments identified in an English collection about five years ago, first reported by P.M. Head in TC: A Journal of Biblical Textual Criticism (8) 2003, and cited by Dr Head in Bulletin of the International Organization for Septuagint and Cognate Studies 36 (2003), esp. p. 28, n.1, and in the Tyndale Bulletin (56) 2005, esp. p. 61, n.1. It is written up more fully in the current issue of the Journal of Theological Studies, n.s. 59 (October 2008). The text was originally identified by Dirk Jongkind, and the dating of the fragment is credited to the advice of Professor Herwig Maehler. It has also been photographed for the website of the Center for the Study of New Testament Manuscripts, Frisco, Texas." Juan Hernandez, "A Forgotten Early Byzantine Textual-Critic: Andrew of Caesarea on the Apocalypse"
"Textual critics today attend to a variety of pressing questions related to the transmission of the Greek NT. No longer limited to the quest for the 'original' text, current practitioners pursue a variety of interrelated interests. Scribal activity, theological variation, the NT canon, and the socio-historic worlds of manuscripts are now commonplace in text critical discussions. These questions, however, are not altogether new. Neither have they been evenly applied to the full corpus of the NT. The text of John's Apocalypse remains an area in desperate need of attention. Ironically, the past may hold the key to the future in this case. Writing at the threshold of the early Byzantine era, Andrew of Caesarea already displays an awareness of competing variants within the Apocalypse's MS tradition, comments on their theological significance, and even anathemizes those scribes who 'atticize' the biblical text. In fact, Andrew"s Greek commentary reflects the very integration of issues that characterizes today"s text-critical research. This paper will explore the relevance of Andrew"s use of the Apocalypse for discussions of its textual history and interpretation." Hernández' final remark: "We are often elated when we come across a significant variant, especially if it can be conscripted into a greater cause. These often serve as “windows” into another time and place, when things were still in flux and being fought over. If Andrew teaches us anything, however, it is that what fascinates us may not be what fascinated the ancients. We find significance in theological variation and imagine the communities that would espouse or even create such variants. With Andrew, however, textual variation was only an opportunity to certify what was already known to be true. The potential threat of a textual difference was easily mitigated by appeals to Origenic modes of exegesis, the sayings of the Fathers and the dictates of Chalcedon. Even Andrew’s complaint about “atticizing” appeared to be more about cultural pretension than about the text of the New Testament. And although Andrew cannot be credited with proffering any additional canons for our use in the quest for the “original,” we can nonetheless gain much from him as we explore the appropriation of the New Testament by various communities of faith." "Dreadful is the curse upon those counterfeiters of the divine words, capable of depriving the arrogant of the good things of the coming age, since their rashness is bold indeed. Therefore to keep us from suffering, [John] warns us his hearers, lest we add or take something away. But those who regard writing in the Attic style and the language of syllogisms more reliable and more dignified are rejected." The reactionary linguistic movement known as "Atticism," is a reversion to classical Attic grammatical and lexical standards, that set in toward the end of the first century CE and which was to heavily influence many Church Fathers. However, there was resistance, as reflected in Andrew of Caesarea's seventh-century commentary on Revelation (which often accompanies Revelation in the MSS). The second-century writer Phrynicus of Alexandria had banned 424 non-Attic terms in his Ekloge. Nineteen terms on his list appear in Revelation. However, according to Hernández, only four are changed from a non-Attic to Attic terms in some MSS. Significantly, however, apart from atticism/non-atticism Andrew seems to reflect an attitude similar to Origen on textual matters, in that he accepts more than one reading when he knows more. In the time for questions, Hernández was asked whether there are explicit references to manuscript variation by Andrew, and the answer was positive. He had found one or more references. A funny thing was that Hernández had translated portions from different chapters in the commentary, leaving out some parts temporarily, because of his too optimistic schedule for this work, which he could not keep up with. Instead of revising the schedule he had skipped ahead, so he could now share various observations also in the latter part of the commentary. 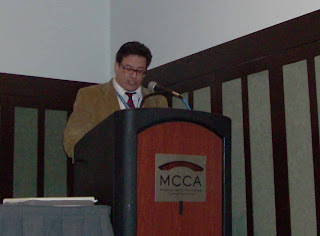 Hernández has been working on a translation and monograph of Andrew of Caesarea's Greek commentary on the Apocalypse. Recently, it turned out that someone else is also working on a translation of Andrew soon to be published in another series. I am confident, however, that Hernández' work on Andrew will eventually make a valuable contribution to the scholarly community in one way or another. Update:: I have updated the post according to some remarks sent to me by Hernández. The next paper from the NTTC session on Saturday afternoon was delivered by Hans-Gebhard Bethge, Humboldt-Universität, Berlin. Hans-Gebhard Bethge, "New Testament Texts in Recently Published or Discovered Coptic Manuscripts"
Bethge started by expressing his strong support for Askeland's ideas that had just been presented. Then he basically presented a survey of recently published or unpublished Coptic MSS, of the NT or related (i.e., those that cite the NT). First he drew the attention to a papyrus in the British Library, BL. 15031 containing Matthew 25. This apparently has an anti-heretical orientation. Betghe was not sure if the textform represented an unknown version or whether the peculiar text was related to its particular use. He argued for the evaluation of many codices laying around in various collection. [TW: one should as far as possible, however, differentiate between continuous-text NT MSS and other types]. Bethge then discussed the Berliner Coptisches Buch, which deserves more attention. It has been published in a very good edition. It is very ancient and it cites the NT, the Letter of Barnabas and the Sibylline Oracles 8. Bethge "guaranteed" rich awards in the study of this text. The special citations, once again, may have to do with the context. He then moved over to NT MSS. There are many new Coptic MSS [cf. Askeland's paper], many of which are complete. A lot has not been published. Biblica Coptica by Karl Heinz Schüssler is a vital resource. Betghe mentioned someone else doing important work in Strassbourg (whom I cannot remember). However, he lamented the fact that not many scholars work with the Coptic. Then he shared a nice story when he was in the British Library. There he found a piece of fragment from Philemon from the 5-6th century, and another fragment of Mark with remarkable readings. All in all, he discovered fifty-five literary fragments from the 5th century, which were not recognized by Crum, et al. Apart from Mark and Philemon, there were also texts from John, ch. 1 and ch. 19, that could originate from the 4th or 5th century. The next example is another Schøyen codex, "Mae 2." Bethge says scholars agree that it goes back to a Greek Vorlage. Schenke thinks it is independent, and correct translation of entirely different Gospel of Matthew (Hebrew Gospel of Matthew). [TW: this is the one James Leonard is researching; we all hope he will come up with significant results. Read more about the two Schøyen codices here]. Bethge's next example was Papyrus Michigan 3520 with Eccl, 1 John, 2 Peter (the text ends in 3:14); a miscellaneous codex published by Schenke, and dated to the 4th century. It is written in a Fayumic dialect. Some passages in 2 Peter seems to be paraphrazed. Is it due to a freely translated Greek text? Manuscripts are always interpretations of the text they reproduce. A sensation is MS. Copt. e. 150(P), published last year. It seems to be a private transcription, and is one of the earliest indication of the fourth gospel in Coptic (dated by Schenke to the 4th cent.). It ends midway down a page with John 20:31, there is some free space on the back side of the space. Bethge thinks this is probably an indication that ch. 21 could or could not be included! P66 is the oldest witness and does contain ch. 21. This piece is a continuous text MS (there is no pagination, so we cannot say that it is the last page of a complete text of John). His final example is a large MS in the Pierpont Morgan museum with the Book of Acts, but the pages are glued together, so it has not been opened (yet). Bottom line of the paper: there are plenty of unexplored Coptic material out there. As a final note, Bethge announces that he will edit the other Tchakos codex with the mathematical treatise, the Pauline letters, etc. The text will be published as facsimile with comments and evaluations. There will be more to tell at the next SBL. It is an important MS from early times. Greek Vorlage is assumed to be from the 3d century. 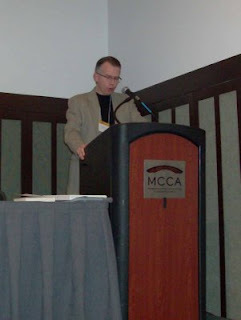 Here comes the next presenter of the New Testament Textual Criticism session, Saturday afternoon. It is no other than our co-blogger Christian Askeland (with the beautiful Norwegian name). I hope Christian can edit this post in case I misunderstood or omitted something important. Christian Askeland, "Has the Coptic Evidence Been Properly Used in New Testament Textual Criticism?" 1. To better understand the literalism of the Coptic translation ("selectively literal"). The version parallells the Greek Vorlage with an approximate "Greek word order" and Greek loan words, but sometimes it departs. To demonstrate this "selectivity" Askeland presented an analysis of the occurences of Greek δε and Coptic δε in the NT. In the NT (NA27) δε occurs 2791 times, but Coptic δε in Sahidic 3368 times (121%)! The Bohairic (Horner's ed) has δε 2695 times (97%). And there are differences between the NT books (according to a handout with nice tables). Hence, δε and other Coptic words were added or omitted as against the Greek Vorlage, i.e., in this regard the Coptic version shows a relative independence from the Greek. Conclusion: Coptic Biblical texts reflect different translation styles. The Coptic MSS are sometimes cited as supporting the Western text. However, a significant portion of readings seems to derive from Coptic translation tendencies. The Coptic translations tend to make explicit what was implicit in the Vorlage. For example in John 11:34, the Coptic adds the indirect object (which is only implied in the Greek); no known Greek MS has αυτοις where the Coptic consistently have the equivalent of αυτοις. This happens several times. The same phenomenon occurs in the Latin and Syriac traditions! So this type of variation may derive from translation techniques. In conclusion, agreements with a few Greek MSS may depend on translation techniques. 2. The Bohairic cited in the NA27 is dated to late centuries. Now we have more earlier findings. Askeland's initial research shows that the late Bohairic has affinites to the early Bohairic versions. He referred to an example in John 6:6, which I cannot remember, but there both the classical and early Bohairic renders the verb similarly without Greek support. There are multiple agreements of this type. This leads to the question if the early Bohairic underwent several revisions that resulted in the classical. (Then the evidence in NA27 may not be of so great significance, i.e., the classical does not go back to a Greek Vorlage, independently, but has been redacted/revised). 3. NA27 on the whole deals rather well with the Coptic, but not in the PA (John 7:53-8:11)! I did not note the details here, but I think Askeland mentioned that three Bohairic MSS contain the PA, whereas twenty-four omit it. During the discussion, Askeland estimates that 10% must be relegated in John, but even more if the classical Bohairic is removed. Not those cited under siglum "co" (many are supporting txt), but if one shifts over to single Boharic MSS then there are some odd readings (corrected readings, etc), and it is here that the many unreliable are found, they do not reflect a Greek Vorlage. The INTF (Münster) strategy seems to have been to "put it all in," so that no one can not criticize for inconsistency, considering that there is no worked out methodology for excluding material. This fact (that everything is in there) actually made Askeland's own project possible (e.g., to find occurences of δε). * Develop a method for citing single Sahidic MSS, absolutely for those from the earliest centuries (cf. the Old Latin) - the Crosby-Schøyen MS 193, for example, is the earliest witness of 1 Peter. The Sahidic should not be cited when corrected. Epilogue: Inspired by Christian's paper, I ventured to comment on Eva-Marie Becker's paper in the session of the Mark group, where she argued for a different structure of Mark 1, appealing to the reading και εγενετο in 1:4 (txt: εγενετο), attested by Sinaiticus and some Boharic MSS (if I remember correctly). I pointed out that the addition of και in the Bohairic version is probably related to translation technique. I suppose her other reference to και μετα in v. 14 attested by B and D, and some OL and Bohairic witnesses must also be evaluated with caution in this respect. It may have to do with scribal proclivities and translation technique in combination. My report from the SBL in Boston continues. The following is a summary from the first paper of the New Testament Textual Criticism session on Saturday afternoon. This was the session in which I presented a paper with Jennifer Wright Knust, which probably caused some distraction on my part. Since Ehrman’s dissertation on Didymus the Blind, there has been a steady flow of studies on church father’s text especially those located in Alexandria (Origen, Athanasius, Didymus, Cyril). Now the turn has come to Clement of Alexandria. What form of the text existed in Alexandria in the 2th century? Did his text influence later fathers? These questions led Cosaert to research the subject. In this paper he summarizes his study of the text of Clement. The study is based on testpassages in Matt, Luke, and John. The methodology was developed by Ehrman (including Comprehensive Group Profile Analysis). The first step, however, involves the identification of citation and allusions. These are then collated against control witnesses representing various textual strands, and also including other Alexandrian fathers. The first table displayed data based on 118 significant variations in Matthew. At the top, closest to Clement were Athanasius and Origen, then Sinaiticus. After that came a puzzling combination of witnesses. It has been suggested that Clement’s text represents an “early stage of Alexandrian text.” The conclusion in Matthew, however, is that Clement has no clearcut agreement with any one group. It is split between the Alexandrian and Byzantine groups. Cosaert had hoped that the group profile analysis would clear things up, but it did not. Clement does not preserve any distinct readings for a goup. The results have been more definitive in Didymus and Athanasius. The text of Clemens in John has much clearer affiliation. Alexandrian witnesses dominate the top of the list (7 of the first 10 are Alexandrian). According to Cosaert, it is not surprising that Didymus is at the bottom of the list, since Didymus according to Ehrman shifts textual character in John. Hence, Alexandrian is probably the classfication to apply in John. But in Matthew and Luke the text is mixed (with Byzantine influence in Matthew, Western in Luke). The results are different from other Alexandrian fathers. 1. Clement’s textual relationships may not be so clear because the readings are not distinct or exclusive for any one group (shared by more text types). [This is a good reason!] Then he looked at variants. For example in Matt 12:36 it was apparent that the testpassage was not so useful for classification purposes, since the tradition is split. Same in other examples in Luke 10:21 and 10:42. There is some need of adjustment. 2. There were two major text types, Alexandrian and Western, without any one dominating. [TW: Or, Clement used different sources.] There was no clear situation in Alexandria. The text is more mixed (cf. also the Coptic tradition). Cosaert also looked at how Clement used the text. For example, whenever he is using Paul he seems to clearly follow a manuscript. Furthermore, he often he attempts to harmonize. Hurtado: The suggestion that there are different transmissional dynamics is compatible with analysis of papyri too. Some are diificult to classify, and other like P75 align with later witnesses (continuity). Jongkind: What do we mean with a “fluid text”. Does not your conclusion undermine your own analysis (there was no clear text types at this time, they develop later, why include them?). Read more about Cosaert’s study as reported previously on this blog here. Dan Wallace reports on the death of Zane Hodges and writes a tribute here. "He never earned a doctorate, and intentionally so: he thought that such a degree might make him proud."